“Blue skies, smilin’ at me,” is the first line of an Irving Berlin show tune from the 1920’s. “Nothin’ but blue skies do I see.” It’s a classic hum-able song that makes you feel good. Blue skies are a kind of shorthand for that good feeling. 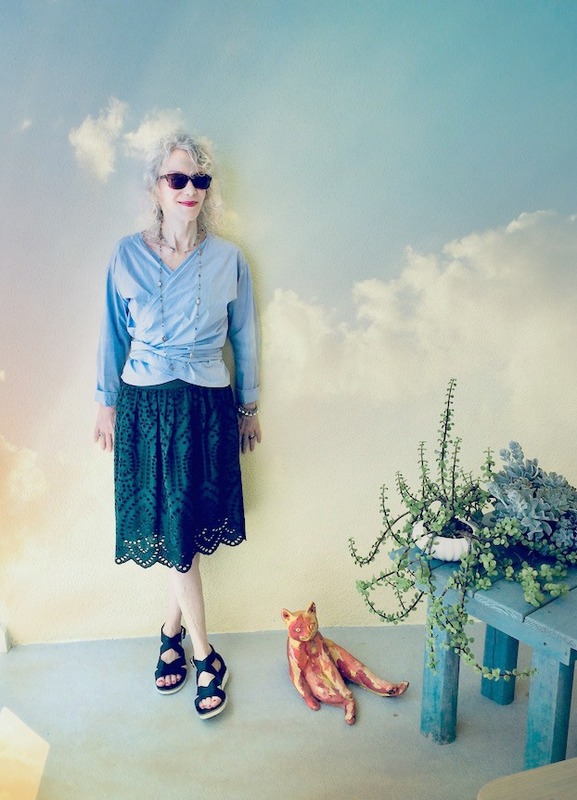 While I love a blue sky, I don’t often wear pastels, as they wash out my pale skin and hair. But I enjoy the sky blue of this wrap blouse by UNIQLO. I like the neckline too, open without showing a lot of skin. The wrap makes for a defined waistline too. I brought the blue skies into my set using a PicMonkey filter. 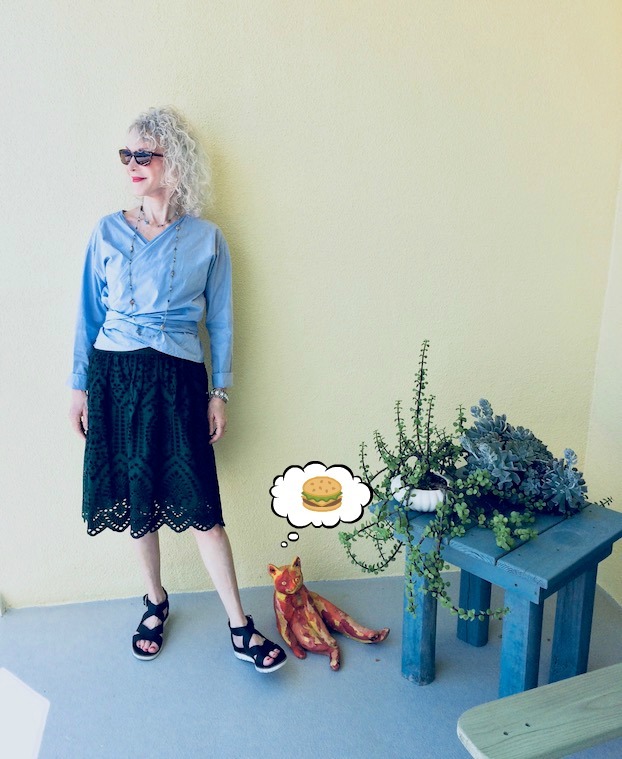 The deep green eyelet skirt from Loft is soooo great for Florida summer: cooler than shorts or capris and with a feminine hemline. I like to wear it with a simple knit tank top, and no accessories, for a clean look. Showing off the skirt details and my “rich girl” crystal bracelet, thrifted in Hell’s Kitchen NYC. I adore this outfit on you, Patti! The blouse is so versatile (I ordered one a bit similar to it from LOFT summer sale), And the skirt is gorgeous! That’s such a chic wrap top, and I love how you styled it with that pretty eyelet skirt! So feminine but cool too. I really love your eyelet skirt and it looks lovely with this wrap blouse, elegant! and your sandals look fab, comfy and cool! You do look cheery like Blue Skies in your wrap top and lace skirt. I love how you added a little blue sky with PicMonkey. It became an accessory to your fabulous outfit. Sending sunny smiles your way. I think the colour of this top is great with your eyes. You know I love a wrap top Patti and this one is fabulous! Uniqlo, who would have known? Beautiful color as well! I’m in love with the eyelet skirt Patti. You look so lively as always! Love the dark green with the light blue…beautiful combination my friend! Wow, that blue skies filter completely through me for a loop and i thought you had painted the wall! Which would have been cool! thanks for sharing and hosting. Love the wrap top on you , so flattering and a pretty color! I love the evergreen eyelet skirt! I saw this too and was tempted. It looks wonderful on you. Great color leading into Fall too! Such a great look, Patti! Always love a little eyelet and the blue wrap blouse looks so pretty with the green. Great styling and those shoes look so comfy! I love your outfit and the sky photo edit. And, above all, that song. We are having such perfect, cloudless azure skies, and Willie Nelson’s voice always creeps into my head as I walk about. This is a great outfit, and one I would totally wear. I’m checking the link on the skirt. So pretty! LOVE that top! I love a wrap top too — that shade of blue is just perfect. The thought bubble above your kitten made me giggle. Love that filter, very clever! I can also get a bit washed out by pastels, I always find a strong lippy helps combat that on the rare occasions I wear pastels. Wishing you real blue skies this week!! Wow Patti! Love this look, especially that wrap top. I own nothing from Uniqlo, I really need to head to Disney Springs and check them out. Such a pretty look on you! Ha ha you need to feed the cat Patti! What a lovely blouse, I love wrapped blouses and dresses! Oh, I love the cut of that blouse, Patti! And that skirt’s details are so lovely. Wishing you peaceful blue skies! Thanks so much for hosting “Visible Mondays”! 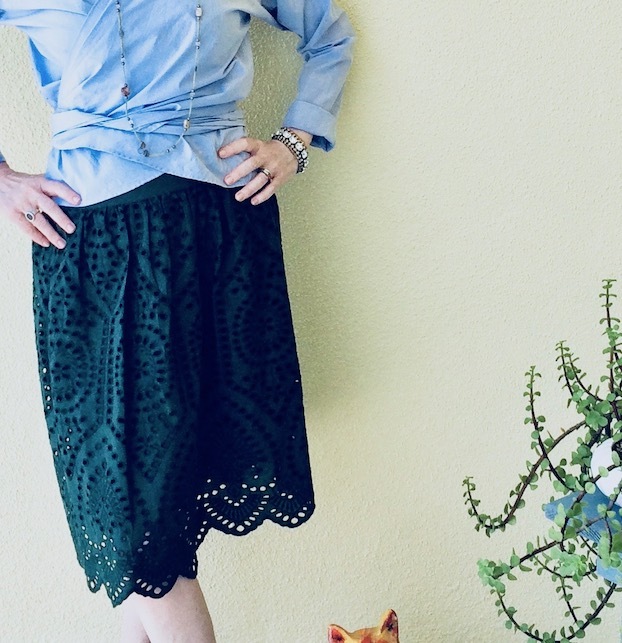 I love your wrap blouse and eyelet skirt, and they look great together! Thanks for hosting, wishing you a wonderful week! Patti, your lace skirt is fabulous and the whole outfit is marvelous. Full of details and yet simply elegant, just like you. Thanks for hosting and I hope you’ve had a wonderful weekend. So lovely—-ez like Sunday Mornings vibe. Blue is one of my fav colors and love baby blue. I actually think your light coloring goes well with pastels. Baby blue is my fav pastel of all time and I love pale colors with light hair. What a great color combo, Patti!! That skirt is so fabulous for the summer! Ahhhh you had me fooled, thought you had a mural painted on your wall. Love the skirt! I have a similar longer version in teal. You look lovely in sky blue! My “Blue skies smiling at me” post was with Rod Stewart, but I like Willie’s too. You look so summery! And you can wear pastels. Well, darker pastels, like your top. I hope you’re enjoying summer!